One year ago on this date, we set out on the craziest, most awesome, and challenging adventure we’ve had yet in our young lives. It was tough. It was long. It was wet. Thru-hiking the Appalachian Trail was an all-encompassing journey over mountains, through valleys, above the clouds, and under many a welcoming roof. We laughed a lot and cried but a little. We ate terribly and learned to hike over 20 miles a day. We fought through thunderstorms, mosquitos, raging streams, steep climbs, even steeper descents, rain, rain, and more rain. We challenged our bodies, mostly our legs, and our mental and emotional limits. We pushed those limits more than once. Some days, fatigue overrode enthusiasm, defeat reigned above enjoyment, but we came out the other end of trail on top of the most beautiful mountain, champions of ourselves and a trail that is now home. I’ve been thinking a lot about the trail lately, so today I opened up my journal and read my first entry. We survived our first day. 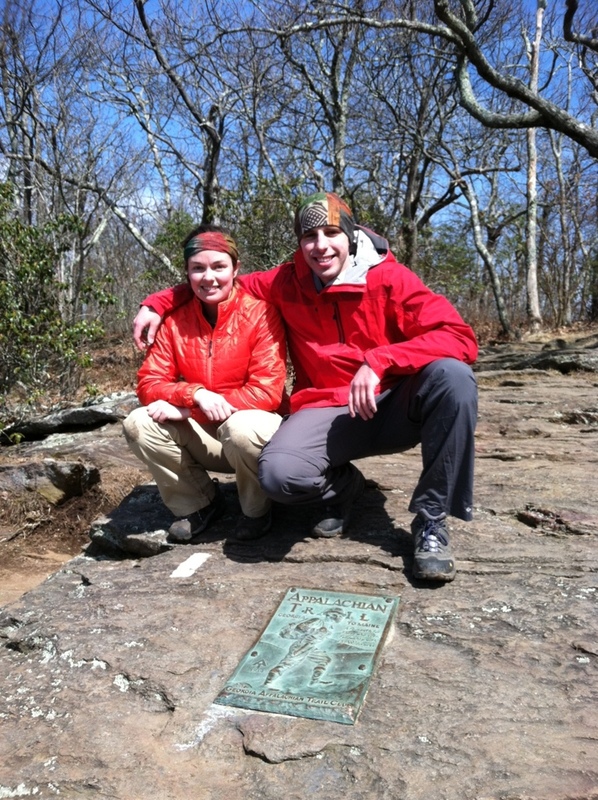 We only did .2 of the AT and the first part was on the Approach Trail. The 600 or so steps up to the falls were tough, but they didn’t take too long. That was the toughest part of the day. The rest wasn’t bad at all I don’t think. We did well and it only took us 5 hours, 20 minutes to hike to the shelter. My knees hurt and also my legs in general. My arches hurt some too, but the inserts help. I feel a blister coming on on my left foot, but I will do my best to prevent it. I’m tired but I think that’s good. Overall, I feel good and don’t regret our decision to thru-hike. I’ve already met a lot of nice thru-hikers from all over: New Hampshire, Wisconsin, Hawaii, Pennsylvania, Mississippi, Massachusetts, and Florida. Looking forward to the warmer weather tomorrow and in the days to come. 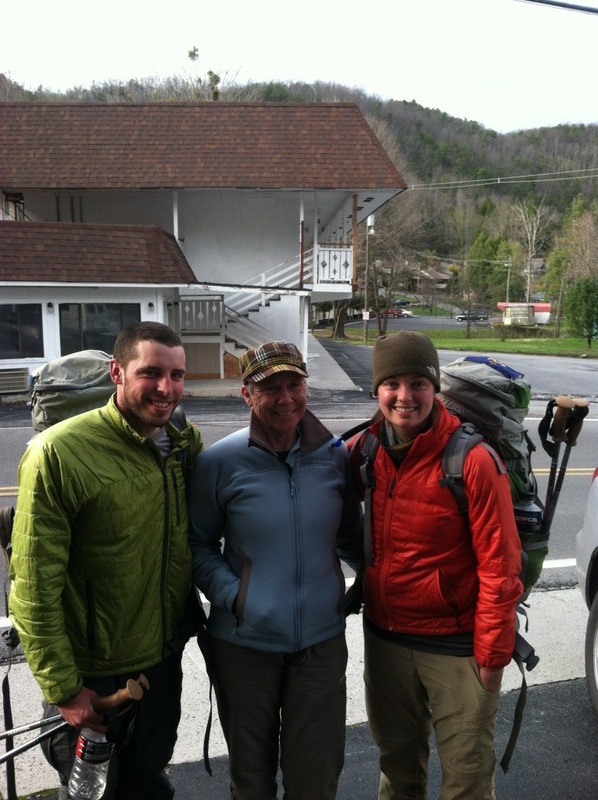 Well, geeze Lindsey, I sure hope you wouldn’t regret your decision to thru-hike after only one day! It was a short entry compared to entries later on, but I remember our first day like it was yesterday. I remember the mild temperature, the pure excitement of everyone, and meeting Pumpkin Head and Sunshine on that first day, who both finished the trail as well. We met some characters along the way and had a windy, chilly night atop Springer Mountain. Seeing that first white blaze was when our journey truly felt real. It was no longer a dream, it was the beginning of our journey, one year in the making. I did get a blister on my left foot on the third day heading into Neels Gap and those inserts were awful later on…and the Keens too. Never again. The steps were a cake walk compared to other climbs we did later on, but on your very first day with a full pack, it’s not as easy as one might think. Reflecting on what we experienced along the AT, I can truly see myself as a different person. I’m way more confident and find myself more at ease in meeting new people than I ever was before we thru-hiked. I know first hand that I’m more capable physically and mentally than I thought I was a year ago. 5 months of hiking will prove that to anyone. I do my best to never forget how amazing a hot shower feels or how easy it is to access to clean water and hot food. When I have to walk to my car in the rain for 30 seconds and I accidentally step into a huge puddle, I don’t get upset. I’ve got about 10 pairs of dry shoes and more socks than I count waiting to change into. Before we left on our hike our dear friend, Mamaw B, gave us a piece of advice that I still carry with me to this day. She told us not to let the things that we could not change on the trail, like the rain or trail conditions, affect us negatively. We can’t change it, so just learn to embrace it and keep on hiking. Just as everyone thought spring was around the corner here in Maine, we were hit with more snow, ice, and cold weather. While I look forward to spring, I’m going to embrace the cold and snow rather than curse it. We’re going skiing next weekend and there’s still time to enjoy some snowshoeing. I’m still able to run outside, I just have to throw on a few more layers. We have heat and plenty of blankets in our apartment to stay warm. Before we know it, everyone will be complaining about the heat. Instead, I’ll remember Mamaw’s advice and run down the street and jump in the ocean instead and sleep outside when our apartment is sweltering hot. With Mamaw B in Gatlinburg. Another step from where I found myself a year ago is that I know now how I want to live my life. The last time we saw fellow thru-hiker, White Out was in the 100 Mile Wilderness just past White Cap. It was a rainy, windy day and we stopped to eat a snack before deciding to move on to the next shelter in the pouring rain. White-Out said the most powerful statement I heard on our entire hike, and it was stuck with me ever since. 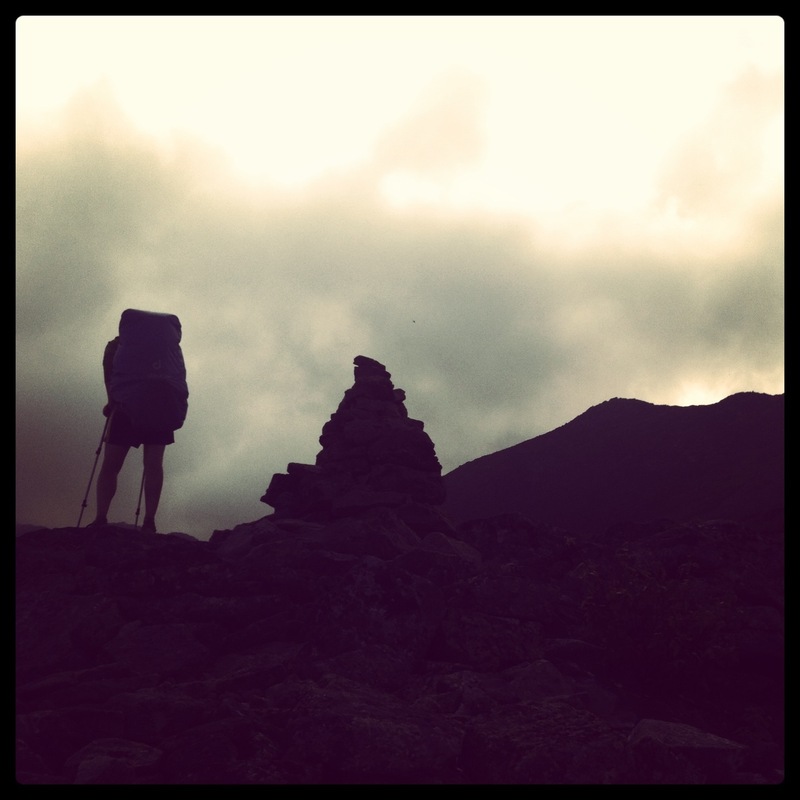 He said that he learned that thru-hiking wasn’t about trying to figure out what you want to do with your life, but how you want to live your life. That is exactly how I feel today, one year from the start. I’m still figuring things out, and aren’t we all throughout our entire lives? But, I have a clearer vision of how I want to live my life than I ever have before. I know that I never want to give up the traveler’s spirit. I know that I want to be my own boss. I want to seek out greater and greater challenges. I want to learn more patience and acceptance. I always want to be a learner, but also a teacher to others. I want to give more than I receive. What I want to do with my life isn’t simple and I don’t think it ever will be for me. But, how I want to live is easier to define. To travel, to write, to photograph and most importantly, to document. Not knowing what my life would be like in a month, 6 months, or a year used to be stressful. Now I see my future as open as it has ever been and it truly is exciting. Will I be hiking again in a year? Will I be traveling across Europe? Or will I be in Portland training for my first triathlon? I don’t know. The trail taught me to be okay with that. I have many answers yet unknown in my life, but I do know that the trail has morphed my very being and has ever-changed the adventure that is my future. I too recall some of the things you mention: Your first blister, the winter weather you hit. and the comment by fellow thru hiker Whiteout about discovering HOW you want to live your life. I liken it to knowing the KIND of PERSON you want to be even though you may not know who you are or will become. Thanks for the reminder of this great day one year ago. I think you know by now that there was some growth and letting go and a lot of TRUST that the parents experienced as well. Well put, Flash. I too came off the trail with a vision of not what I wanted to do with life, but how I wanted to live. I vowed to spend more time with family and friends and I promised myself I wouldn’t work so darn much. I’m following through on those goals. People ask me if I will start my vegetable farm again and my answer is that I’m just going to adhere to my values and the things that are most important to me (friends, family, nature, good food, community, health, happiness, fulfilling work, spirituality) and my life will shape naturally around that. Thank you to both you and Miles for the post card and kind words. My pregnancy has been easy and enjoyable and I’m so excited for the experience of labor and getting to meet this little person for the first time. (I’m trying to come up with a labor mantra… No rain, no pain, no baby? Haha j/k) Having hiked the AT has given me the strength and confidence to face this next big challenge in my life. I’m so glad you were a part of that journey. Be well! I stand and applaud your accomplishments! What a great memory of a life-changing experience. As you reflect on your hike and begin to write a book about the adventure, I am just about to step out on that same trail. I am getting a rather late start (April 26), but I am looking forward to the trail.